With one sequentially #'d autographed or jersey card in every pack, it is obvious why hard-core collectors are salivating for SAGE Autographed Basketball 2004-05, shipping Sept. 21st. The best value in trading cards returns in search of yet another Tuff Stuff Award and, like every SA�GE product, features every card inserted directly into packs, there are zero redemption cards! 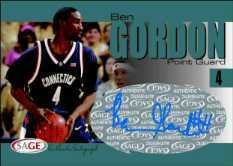 That includes rare treasures like the Master Edition 1/1 Autographed Cards, Master Edition 1/1 Jersey Cards and Autographed Jersey Cards (sequentially #'d to 10) of all the draft's big names including Emeka Okafor, Ben Gordon, Shaun Livingston, Josh Childress, Andre Iguodala, Sebastian Telfair and many more! SAGE Autographed Basketball 2004-05 is the only product to also include perhaps the greatest female basketball player of all-time, 3-time NCAA champion Diana Taurasi. 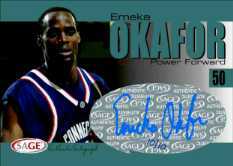 It is also the only product with rare and exciting Jersey Combo Cards including exclusive combos like Emeka Okafor/Diana Taurasi and football/basketball combos like Eli Manning/Okafor. Like HIT 2004-05 Basketball, product quantities are extremely limited with half the quantity of 2004 Football produced. Therefore, collectors are strongly encouraged to contact their local card shop or Authorized SAGE Distributors to reserve product while it may be available.